Restaurant, bistro or cafe website demands sophisticated design that is able to adapt to restaurant style – whether that is italian food restaurant, pizzeria, pastry cafe, winery, seafood restaurant or any local kitchen restaurant. Also a cafe or restaurant website needs proad functionality to present dishes available on food menu, showcase specials and seasonal dishes. Fragolino Restaurant WordPress Theme embraces it all, providing a great solution to create a sophisticated and exquisite restaurant website easily and time-effective. 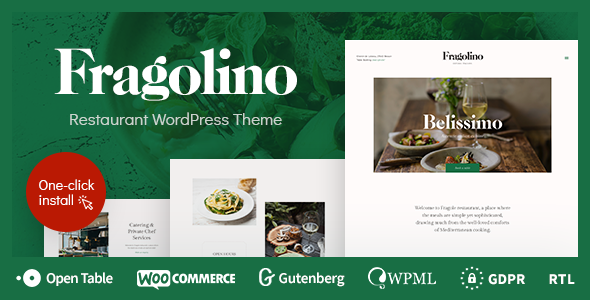 Fragolino is a perfect restaurant WordPress theme with modern design and powerful functionality. With Fragolino you can create restaurants, bars, cafes, pubs, cafeteria or coffee shop websites. The theme comes with multiple pre-built pages included. It provides a special Menu shortcode that is a really handy way to display your restaurant menu – add best offers, show menu images, and list ingredients. 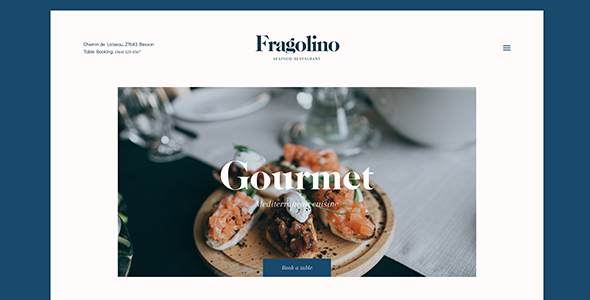 Fragolino includes powerful table reservation solution, multiple homepages for various restaurant styles and huge custom shortcodes collection. The theme is compatible with WooCommerce plugin, you can use it for food delivery service for your restaurant. With one click demo import you can save a lot of time and easily make your site look like our demo, or create unique and complex page layouts with custom and intuitive drag and drop page builder – no coding required. Multilanguage, GDPR and RTL-ready, plugin-compatible and professionally-supported theme will make every day you work with your website be a great experience! Theme niche is bar, cafe, pub, cafeteria, coffee shop, store, delivery, italian restaurant, food, menu, seafood, wine, wine bar, reservation, WooCommerce and other restaurant theme niche. Custom Admin panel – we have greatly extended initial WordPress admin to provide you with more functionality that includes a wide variety of options and settings and provides maximum customization flexibility to help you create Cafe & Restaurant and any food related business website. Detailed Theme Knowledgebase – theme documentation covers all the possible questions, so that even a newbie can succeed to create a great website in a reasonable time. Many screenshots from admin panel and front-end to make it even easier. Layer Slider & Revolution Slider – this Wine Bar & Restaurant WordPress Theme comes with two popular slider plugins included, a Layer and Revolution Slider, both have supreme functionality and breathtaking effects. No need to purchase them, it’s all in! Custom Form Builder Tool – Cmsmasters team has created a custom form builder tool that lets you create questionnaires for your website. 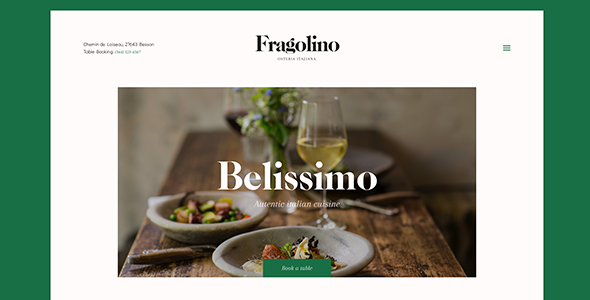 Responsive Layout – Fragolino – Wine Bar & Restaurant WordPress Theme has a responsive layout that will respond to your screen width and make content appearance be perfect on all devices, from large desktop screens to mobile phones and tablets. Retina Ready Theme for WordPress – Retina displays set special demands to websites, and the theme is developed to have an ultimate performance on all retina displays, providing premium presentation quality for your website elements. Advanced SEO for WordPress – this Wine Bar & Restaurant theme has an optimized code and structure, as well as fantastic Custom SEO options for every page and posts, allowing you to easily add important SEO meta data to all your website content. Unlimited Menu Colors – unlimited color possibilities for your main navigation and many other website elements lets you adapt your website appearance to your company style. You can set any color to each of your menu elements. 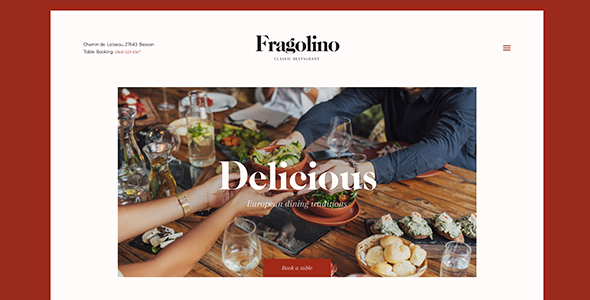 If you need to create a website for restaurants, cafes, bars or other restaurant related business, Fragolino WordPress Theme will do the work for you.